Because I do not have a favourite colour, I drew about me when I did have a favourite color. I was about 4 and in my kinder, my teacher asked about our favourite colour. I noticed that all the girls liked pinks, boys liked blues and reds, every colour was mentioned, but yellow. I felt so sorry for yellow that when it was my turn I said it was my favourite. I did not want yellow to feel lonely and unloved. Yellow should for sure get lots of love! 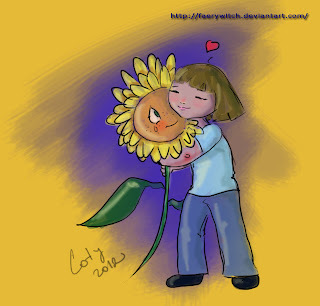 And the sunflower is yellows perfect mascot. aw, sunflower is so happy to finally get some appreciation! Our nursery is yellow, and it's my favourite room in the house.